Creating the right repair invoice can be tiresome. However, the Dual Type Repair Invoice Template is a quick and simple way to create a document for your business or organization. With a straightforward settings page you can easily transform this template into a professional invoice sheet that represents the quality services you provide for clients. To get started you simply download the file below. Once you open the template you can begin to customize all the necessary information to suit your unique organization! The “Setting” page allows you to format the document to include your business’s information. Simply fill out any of the bracketed text and replace it with your own under each header. The template even lets you enter the amount of taxes and labor percentages that will be calculated into the total. You will finish by selecting the color scheme that matches your business and the type of repair you offer. 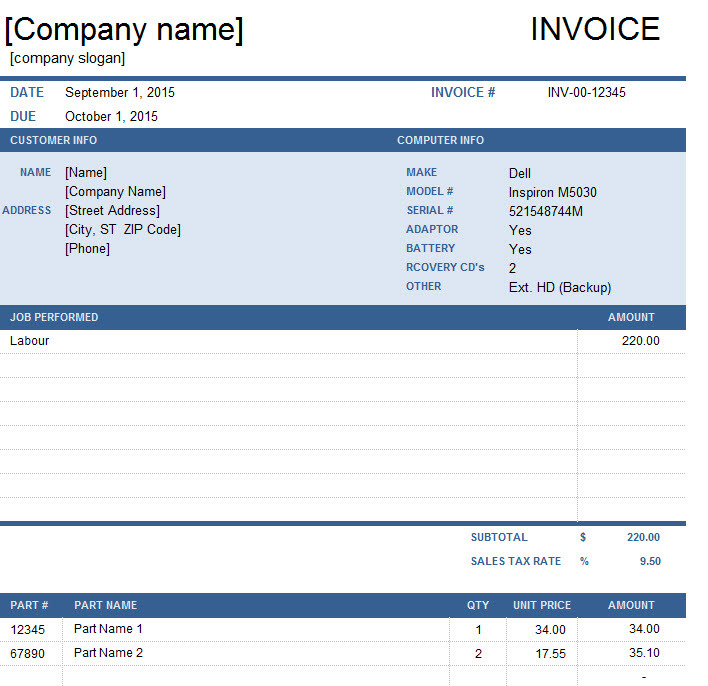 This template is designed to support computer and vehicle repair invoices. The tabs “Invoice A” and “Invoice B” contain two differently structured templates for labor and parts. Simply enter the customer information in the first table and a description of the repair job in the table below that. “Invoice A” provides a section for itemized parts and “Invoice B” lays out the cost of labor. All of these sections will be calculated into the final total. Once you have entered in all the information for a specific job you can print the sheet for you and your customer! Click on the “File” tab in the top-left corner of the template and select “Print”. Writing and tracking your service information is an important aspect of any repair business. It can also take up a lot of time. You can drastically cut the paperwork you fill out each day by downloading this template. It comes with everything you and your customer need to properly document and understand the services you rendered. Get back to the work that matters with the Invoice Template!